Take the controls. It’s no wonder that after playing Dead Space, Resident Evil 5 director Jun Takeuchi has opted to swap RE’s classic set-up for Dead Space’s sidestepping freedom; a change we vehemently protested until trying it out for ourselves. Isaac’s added maneuverability makes racing through the infested corridors a breeze, even without the quick-turn action which was mysteriously dumped during alpha testing. You need this extra control as Dead Space’s monsters don’t just line up for the slaughter. Resident Evil 4 with better controls isn’t a bad sell at all, but the improvements don’t stop there. Strategic dismemberment enforces a much more tactical approach to combat. 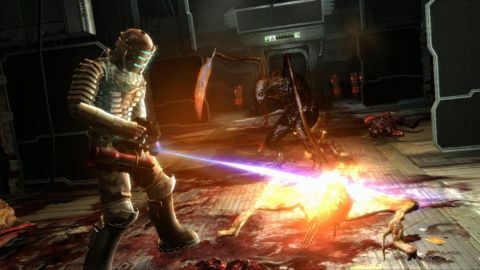 Hacking pieces off the Necromorphs is an integral mechanic to survival and although it tends to limit the design possibilities of your enemies (later Dead Space falls into the trap of using the same monster models but changing skin colours to signify extra toughness) the dismemberment system makes other horror foes look decidedly average. Shooting somebody in the face only to see them stagger and then continue their sprint towards you is disappointing now that we’ve seen the alternative – shooting them in the face and removing their head only to see tendrils sprout from said hole and the beast run in your direction while flailing its arms at twice the speed in a blind rage… We never said it would be pretty. But Dead Space’s real showpiece is its Zero G environments. When the gravity is removed the fun really starts, and you’ll be running along more walls and ceilings than Spider-man. Usually the space hopping is combined with a lack of oxygen. If you’ve not been bolstering your O2 supplied via the BENCH upgrade system, the time limit can make for a tense scramble for the next airlock. Hotfooting it across the ship’s hull with low oxygen reserves is bad enough, but things are made even worse (or is that better?) by the silence. Sound bleeds out along with the oxygen, which mutes the tell-tale warnings of approaching Necromorphs. Lots of care has been poured into the Ishimura’s design, and despite the action taking place almost entirely on one ship you’re never left pining for a change of scenery. The Ishimura’s segregated into various decks and labs, each with a distinct palette. Even when you return to a previous area you won’t feel safe. The first fight through the med labs was a fluorescent-tubed, blood-drenched nightmare, but the return visit forces you to rely on almost torchlight alone before hurrying you along with wave after wave of disaster. Exploring or even re-exploring the decks is a nail-biting experience, driven forward by the film-worthy script and inspired setting. It’s Rapture in space: every bit as disturbing, just as meticulously designed and easily as believable. That’s not to say the Ishimura is perfect. Astonishingly for a horror game there’s an absolute abundance of save locations and stores littered around the ship, and because you’re never far from the next save point the darkened corners aren’t as terrifying as they could have been. This naivety is to be expected from the team whose previous credits include The Godfather, The Simpsons Game and Sims Pets, but it’s forgivable – Dead Space perfects so many crucial elements that this one oversight is largely insignificant. If you want a more tense experience just stick on Impossible mode, which is unlocked after the first completion, and refrain from using the ‘safe’ rooms (though you’ll discover these are far less safe than you’d expect) as much as possible. Just make sure your first run through is on Hard – regardless of how bad you think you are. For such a copy-heavy game it’s incredible to see so much originality shining through. We just wish there was more of it. Ten hours, although far shorter than RE4’s weighty mission, is still a sizeable chunk of gaming. But the lack of any Mercenaries-style extras coupled with forgiving difficulty settings don’t help to prolong the experience. The indestructible Nemesis/Regenerator boss is the scariest beast we’ve ever faced on the console simply because it can’t be stopped, but its relentless pursuit of Isaac is ultimately too short-lived. Description The original and terrifying new IP from EA cribs tricks from all the greats of survival horror's past, but manages to do it so well that it doesn't really matter. The action and controls are fantastic, and the atmosphere and monsters will get under your skin. We wish there was more of the original stuff, like the inventive Zero G sections, but we can live with this, since it might be the best game of this type since Resident Evil 4.